What is FIRE – Financial Independence Retire Early? FIRE is a movement in the personal finance space and its gaining momentum in New Zealand. We have growing numbers of Kiwis (700+) who wants to be FIRE and more people writing about it. My blog is about achieving financial freedom by being smart and lazy so FIRE is my goal. Since this is my first post in 2018, let’s start it with FIRE! 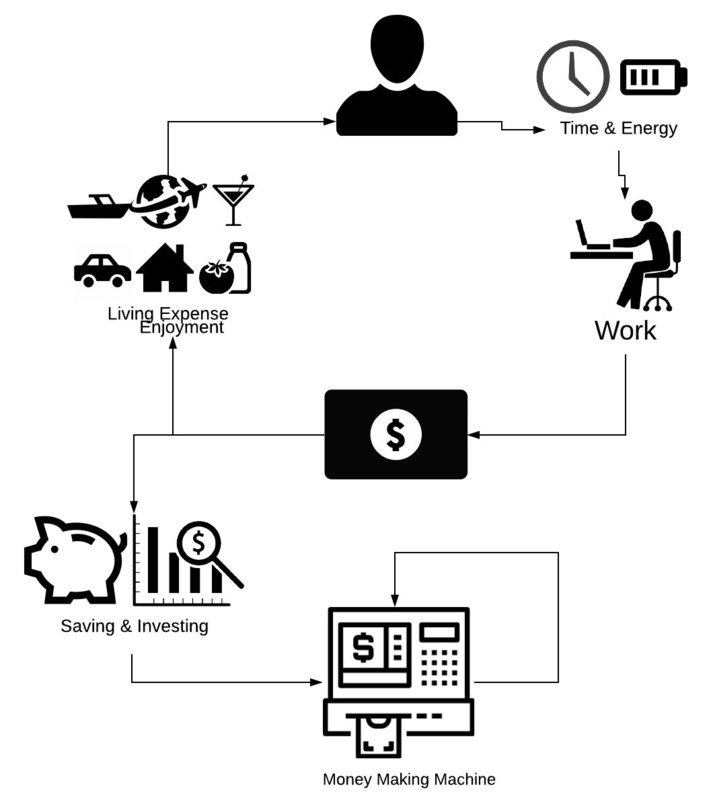 The information and idea in this blog post are primarily based on the work by Mr Money Mustache’s The Shockingly Simple Math Behind Early Retirement, Madfientist’s Shortest Path to Financial Independence and Choose FI podcast’s The Why of FI. Check out their content if you want to know more. 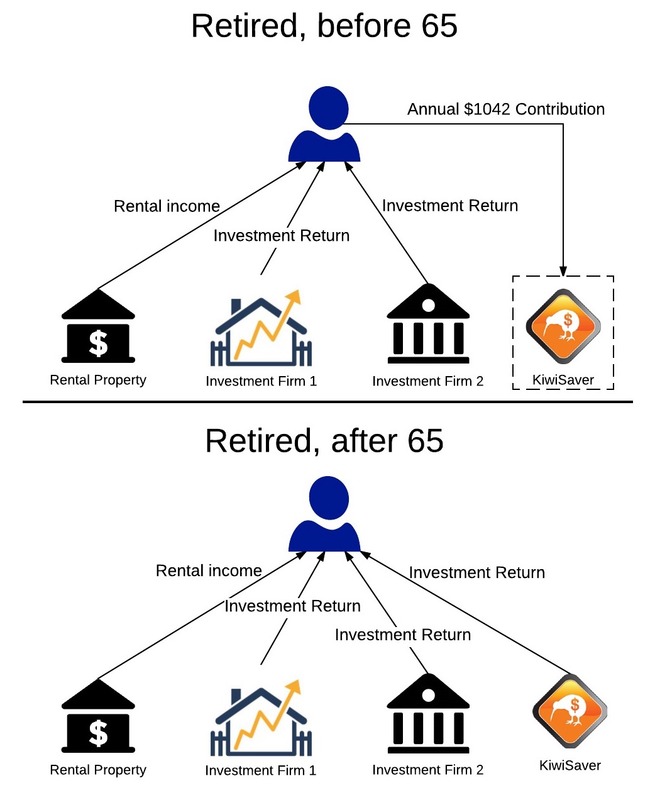 FIRE stands for Financial Independence Retire Early. Financial Independence means you have enough wealth to live on without working. You don’t need a job to pay for your living expenses like rent/mortgage, food, water, power as they are covered by your investment for the rest of your life. Since you don’t need a job to keep you going, you basically can retire early. Here is an example. Let’s say your annual living expenses is $50,000/year. To maintain that lifestyle, you’ll need a job that pays about $63,000/year so your take-home pay will be around $50,000. If you have an investment portfolio worth $1.25 million and you can get 4% return after fees and tax, that 4% return is $50k. Therefore, you can live off this investment and don’t have to work as long as you can get 4% out of that investment. The general idea for retirement in New Zealand is you work all the way from your 20s to 60s and retire when the superannuation or KiwiSaver kicks in. However, in our previous example, we can see we can use an investment portfolio to replace our job. Therefore, retirement is not really about your age. Your retirement should bebase on your investment portfolio and its return. Use our previous example, your living expenses at $50,000 year and your take-home pay are also $50,000. So every year you spent every dollar you earned. If you having the same job and expense, you can’t really retire if you hit your 60s because New Zealand Superannuation only covers $18,729 of your expense. Therefore, you will still need to work in your 60s and 70s, or you will have some serious cut back in your retirement. Now, you can see your retirement is not about your age but how much money you are invested. More importantly, you are in contorl on when and how you retire. In typical New Zealand work life, you got out of school in your early 20s and start working. If you are really lucky, you may actually work on something you genuinely enjoy. However, for most people, we are working for the pay cheque. You may change a couple jobs along the way, and most of you will get better pay during 30s – 50s. On the other hand, our lifestyle trend to improve with our income. That’s what the society says. During your working life, you will get your ‘first home’ with a mortgage, and then a new car, after that maybe you move up to a ‘nicer house’ and drive a ‘nicer car’ with finances. You may still manage to find some money left, why not put it as your down payment for your boat, right? Everyone is doing that! There is always stuff you can buy. Also, since you have to pay for your home, car and that boat, you need to make sure you are on top of your work so that you can enjoy your nice things during your day off. Now you are 65 and the society says you should retire and start enjoying your life. So you go ahead and do all that fun stuff that you don’t have time to do when you are working. However, soon you will relize, you may have the money to do all those things, but you are in your 60s now. Your energy is just not the same when you are in your 30s and 40s. We use our time and energy to work so that we will have money. Then we that money to pay for our living expenses so we can keep working. Therefore, we are using our time and energy to support our living and maybe enjoy a bit along the way. During that cycle, we try to put a bit of money away for our retirement. Once we hit the retirement age, we stop using our time and energy to exchange money. Instead, we will have KiwiSaver, NZ Superannuation and our retirement saving to support our living. At this point, your time and energy are running low. It may seem sad but that is how most of the people live their life. Most of them will spend 8 hours a day, 5 days a week for a good 30-40 years working on a job that they may or may not like so they can have a typical work life that our society expects. Now that we understand most people are trading their time and energy for 30-40 years in that work life, we can start to hack it. Here is an idea, instead of working for 30-40 years and retire at your 60s like everyone else, why not be smart and work hard for 15-20 years and retire while you still have time and energy to enjoy? 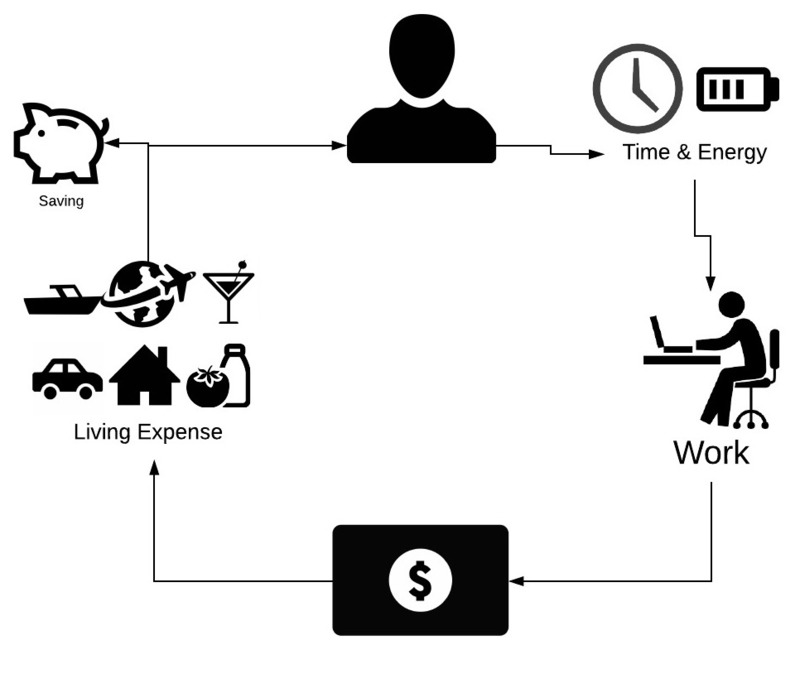 Instead of using your money to buy stuff that you may or may not need, you use that money to buy time for yourself, so you are free yourself from that loop? Let’s look at this graph again. You need to keep working because you need the money to live and enjoy. If we look closer on how we are spending our money, it may look like this. 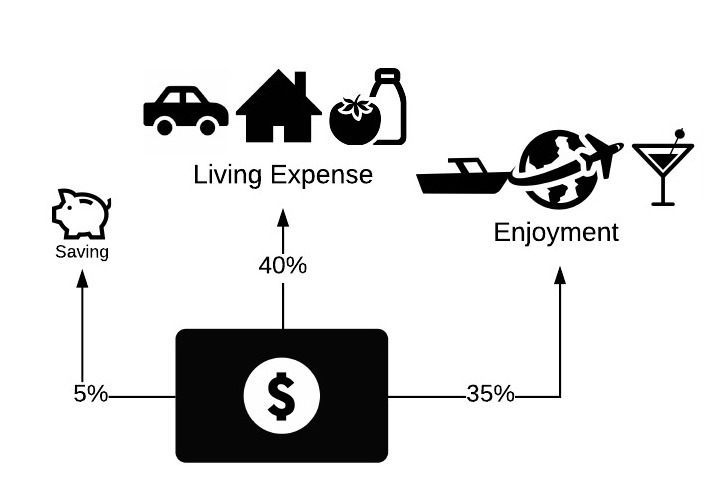 We spent 40% of our income on living expenses, 35% on enjoyment and saved 5%. You may think the saving rate is low, but the data from statistics New Zealand indicate the household saving rate is actually lowered than that. That’s why most people are in this loop and working for 30-40 years is a norm in our society. If we focus on reducing expenses on living, cut back the money spent on enjoyment and channel all disposable income into saving and investing. 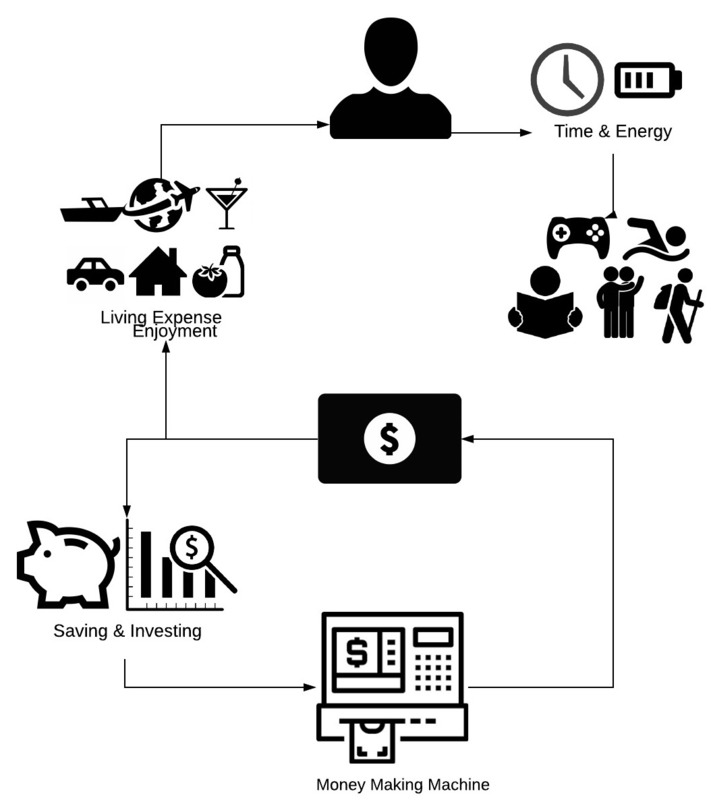 Instead of buying stuff, we use our money to build a money-making-machine. That machine is your investment fund, KiwiSaver, share on the stock market, investment property and cash in the term deposit. All of those investments in your money making machine will gain or lose money from time to time, but it should increase in value in the long run given that you invest wisely. Once that money making machine is big enough to pay for your living expenses while leaving enough of the gains invested each year in keeping up with inflation, iIt will free you from your job. Now you can spend your time and energy to do whatever you like and don’t need to worry about living. If you like your work, you can keep working. If you don’t, you can just quit and whatever makes you happy. You are free from the loop. By the way, I like to think of my mony making machine as a machine to buy ‘time” for me, so I am investing in a time machine. This is my money making marchine – Tardis. It’s bigger on the inside. If you want to join the FIRE community in New Zealand, come and join Kiwi Mustachians facebook group. There are over 700 Kiwis who are on the path to FIRE or already reach FIRE, actively engaging in discussion regards FIRE in New Zealand. Let’s start the FIRE now! Do you need KiwiSaver if you plan to retire early? When we approaching June in New Zealand, you can see lots of personal finance articles tell everyone to put in some money into their KiwiSaver and get the free money. I want to focus on a group of people who is working toward financial independence and wants to retire early. They may think since they are planning to retire way ahead of 65, KiwiSaver is irrelevant to them. They could be in KiwiSaver, but not sure if they should include KiwiSaver as part of their financial independence plan. The government also provide KiwiSaver member tax credit for the first $1042.86 contribution from you each year (not counting your employer contribution). The Government will pay 50 cents for every dollar of member contribution annually up to a maximum payment of $521.43. That’s 50% return on your first $1042. If your wife/husband/partner is not working and you are working full time, you should consider contributing $1042 into their account as well. Those credits are risk-free and guaranteed. It is hard to find such return on the market with basically no-risk. Some people think the big problem of KiwiSaver is you cannot access the fund until you turn 65 or to buy your first home. For the people who are planning an early retirement, they like to put every dollar into their investment so the investment can generate enough income to support their living expenses. They don’t count on KiwiSaver and NZ superannuation to retire. However, you should still put money into your KiwiSaver. One simple question: Do you plan to live beyond 65? If yes, then you should contribute to your KiwiSaver because it’s your money! You will spend on your investment before 65, and you will still spend on your investment after 65. 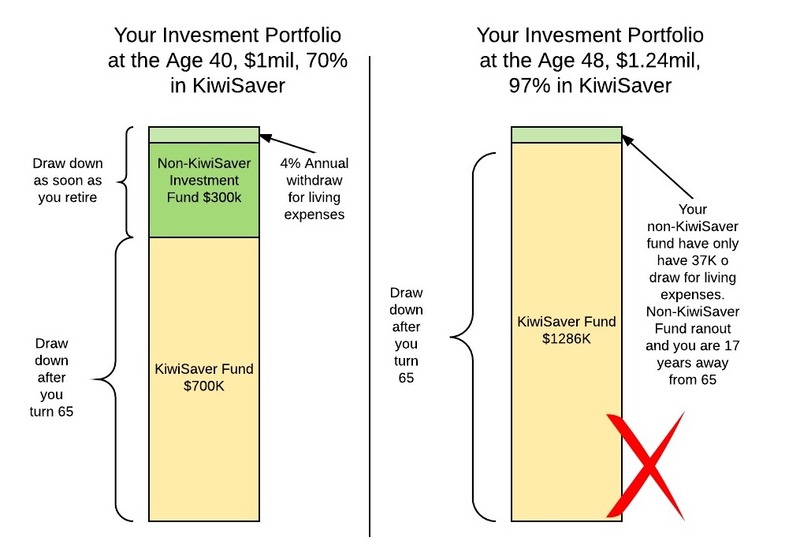 The KiwiSaver fund is just one of your investment funds, and you don’t draw on that fund before 65, it will still help you to achieve your financial independence. Look at the graph below. We assume you need 1 million portfolios to retire early, $300k in KiwiSaver and $700k in a normal investment fund. Your annual withdrawal rate 4%. You just need to stack up your investment and put KiwiSaver at the bottom and only draw the fund at the top. You keep drawing your non-KiwiSaver investment fund before you turn 65 and let your KiwiSaver Fund untouched. 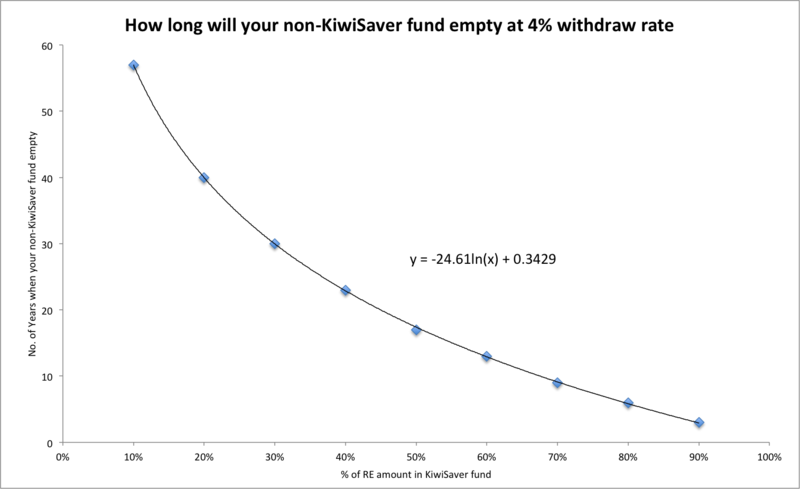 Yes, your non-Kiwisaver fund may get smaller and smaller (depends on your withdrawal rate) because you are drawing $40K (4% of 1 million) on a 700k investment fund. However, your KiwiSaver fund will keep growing. When you reach 65, you can draw from both funds. Therefore, you should keep contributing to your KiwiSaver and include KiwiSaver as part of your early retirement plan. The key is you should not put too much into your KiwiSaver. You don’t want your non-KiwiSaver fund run out of money before you reach 65. Although it’s unlikely but possible. Let’s assume you are 40 years old and have 1 million investment portfolio. 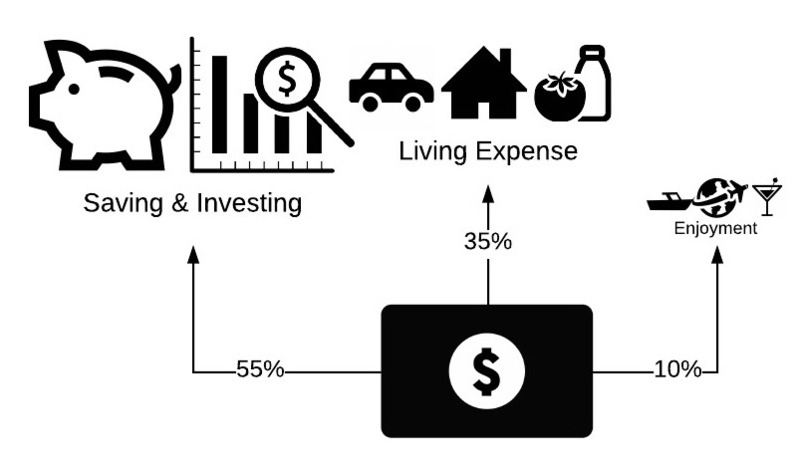 You plan to draw 4% on your investment every year for living expenses. The expected return on investment is 6%. However, for some unknown reason, 70% of your investment are in KiwiSaver, and only 30% of your investment are in non-KiwiSaver Fund. 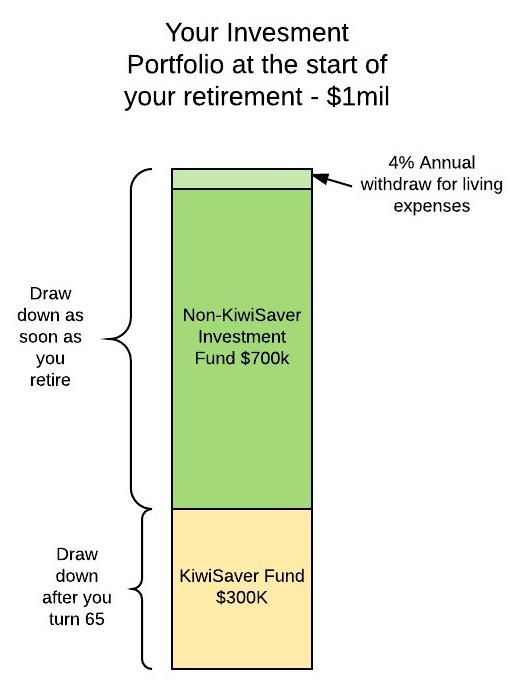 You can only draw from your non-KiwiSaver fund before you turn 65. By age 48, your total portfolio growth to 1.24 million but your non-KiwiSaver fund ran out. Most of your money are locked in KiwiSaver, and you are 17 years away to access them. You need to go back to work. To avoid that, you just simply contribute up to wherever your employer will match and enough to get the member tax credit every year. Put all extra cash into your non-KiwiSaver investment, including paying off mortgage, shares, bond, property, etc. Now, if we reverse that situation and put 30% investment in KiwiSaver, 70% in non-KiwiSaver. That non-KiwiSaver fund will least 30 years. Here is the how the fund works. How long will you non-KiwiSaver fund least? I actually worked out the formula on how many years your non-KiwiSaver fund will least base on percentage of your portfolio in KiwiSaver. The graph was based on 4% withdraw rate. X is the percentage of your KiwiSaver and Y is the number of years will your non-KiwiSaver fund last. If your Kiwisaver is about 18% of your total investment and you are 28, do you need to worry? Using that formula y = -24.61(0.18) + 0.3429, y =42.5. Your Non-Kiwisaver fund will least 42.5 years, by the time your non-KiwiSaver fund runs out, you are already 70 years old. If you plan to retire at age 38, you will have to draw on your non-KiwiSaver fund for 27 years. Using that formula 27 = -24.61 In(x) + 0.3429, x = 33.85%. So your KiwiSaver needs to be less than 33.85% of your total investment portfolio. That formula only works with 4% withdraw rate. You can work out how long will your non-KiwiSaver fund least with your own figure. Check out this google sheets. Make a copy and play around. KiwiSaver is a great investment with a high return on investment due to employer match and government tax credit. It is one of the best investment in New Zealand. You should contribute toward your KiwiSaver to achieve Finacial independence and include your KiwiSaver amount into your equation. Do not over contribute into your KiwiSaver. If you are employed, you should contribute up to your employer match and no more. If you are self- employed, just put in $1042.86 to get your $521.43 tax credit every year. All extra cash goes into non-KiwiSaver investment. If you are not retiring extremely early (in your 20s) and your KiwiSaver is below 20% of your total investment portfolio, you will be alright. If you want to know more about Financial Independence & Retire Early, I will cover that in the future. Meanwhile, Check out the link below.